The NBA 2K League is the first eSports league that is owned and managed by one of the four major US sports leagues. At launch, there will be 17 NBA markets that participate in the first NBA 2K League, and managing director Brendan Donohue believes the popularity of the NBA coupled with the success of the 2K titles gives the league staying power in the eSports arena. In an interview with Josh Cohen, an NBA.com reporter covering the Orlando Magic, Donohue’s excitement came shining through. “Over the last 10 years, 2K sales have gone up by roughly 8 million which is astonishing,” Donahue said of the highest selling sports title. “We have 1.6 million players playing every single day. 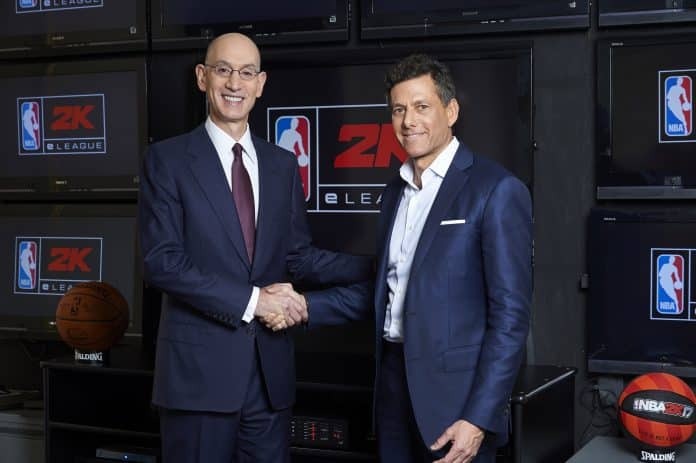 We know we have millions of NBA fans and we know they are more likely to play video games than other fans and more likely to engage in esports than other fans,” Donohue furthered. Even though there are only 17 NBA teams expected to participate, Donohue believes that more will follow, especially after seeing the success of this first year. Aside from just NBA teams, Donohue thinks the NBA 2K eLeague has real potential to become a global league with franchises based all over the world. The 17 NBA teams participating in this first year include the reigning NBA Champion Golden State Warriors, and the runner-up Cleveland Cavaliers. The other 15 franchises that will assemble teams for the eLeague are the Boston Celtics, Dallas Mavericks, Detroit Pistons, Indiana Pacers, Memphis Grizzlies, Miami Heat, Milwaukee Bucks, New York Knicks, Orlando Magic, Philadelphia 76ers, Portland Trail Blazers, Sacramento Kings, Toronto Raptors, Utah Jazz and Washington Wizards. You might notice some big names and big markets missing from this list. The Chicago Bulls and Los Angeles Lakers along with the Brooklyn Nets have all opted to stay out of the league’s first year. Donohue believes they will “expand quickly,” and says “four or five” franchises already have expressed interest in participating in the second of NBA 2K eLeague’s seasons. NBA 2K eLeague details such as salary and player selection were announced earlier this year, but this is the first we’re hearing about the way team’s will operate and be assembled. Naturally, you might be interested in trying out for a team. Tryouts will take place in February, with the draft in March, and the inaugural season will officially tip-off in May of 2018. Teams will be comprised of 5 players with each of them using their own avatar and created player. Sorry friends, no LeBron or Westbrook in this eLeague. From there, teams representing the various NBA teams and those cities will compete against one another. Players who are good enough to be drafted to a team will live in that city, just like they were drafted to play in the NBA for the actual franchise itself. Donahue went on to discuss the criteria for choosing and drafting players to the NBA 2K eLeague. Clearly, there are high hopes for this inaugural season. With over 385 million enthusiasts, and 190 million “devoted” watchers, eSports is one of the fastest growing forms of entertainment around the world. Seems Donohue has every reason to be this optimistic about the NBA 2K eLeague. Be sure to check back with SGO regularly for all the latest news and information from around the world of eSports and the NBA 2K eLeague. Previous articleNBA 2K18 Season Simulation – Who Dethroned Golden State?